An exercise bike can be used at home or at the gym. Biking offers a cardiovascular workout that is low-impact. This means it will not put too much stress on your joints. The simplicity of bike riding makes using an exercise, or stationary, bike a good choice for people new to exercise. Even cycling experts turn to the exercise bike for a workout in inclement weather. Adopting an exercise bike workout plan is an efficient, safe way to improve fitness. 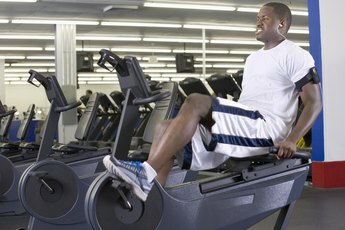 When selecting the type of exercise bike to use, you have the choice of recumbent or upright bikes. Recumbent stationary bikes allow you to sit in a bucket-style seat with the pedals in front of you rather than directly below your feet. These are popular with those who have lower-back problems because they are comfortable and offer extra back support. However, they’re not necessarily easier than upright bikes, which are similar to traditional bicycles, as you’re working against gravity to pedal, according to WebMD. Both recumbent and stationary exercise bikes have the option to increase resistance, so the workout’s intensity and effectiveness depends on how hard you push yourself. When positioning yourself on a recumbent exercise bike, keep your knees at or above hip level, which allows you to use the hip extensor muscles fully. If you choose an upright bike, position the seat so your knees still have a slight bend in them when the pedal is at the lowest position. If you're not sure how to position the bike's seat and handlebars, talk to a gym staff member or the salesperson where you bought the bike. When riding, keep your upper body relaxed, but keep your abdominal muscles engaged to support your back. 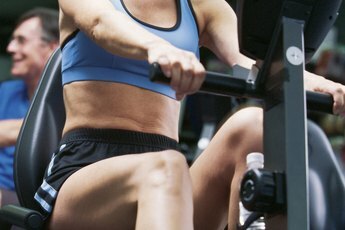 If you’re using an exercise bike to lose weight, incorporate intervals into your workout. A study published in 2011 in the “International Journal of Obesity” found that engaging in high-intensity interval training on a bicycle has a more significant effect on weight loss than continuous, low-intensity riding. Bike incorporating intervals of 10 to 30 seconds pedaling as hard as you can, followed by 60 seconds of rest or light pedaling. Because this is an intense workout, talk to your doctor before beginning interval training. 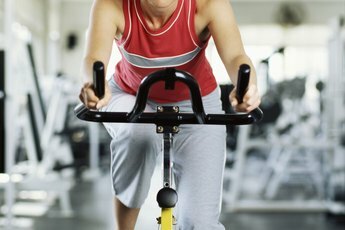 Once you feel comfortable on an exercise bike, consider taking a spinning or indoor cycling class. This group exercise class is taught by a certified instructor who guides you through an intense workout that includes sprints, jumps and recovery. A 45-minute class can burn up to 600 calories, according to the American Council on Exercise. Designed for those who have a good level of fitness, spinning classes require a full water bottle, towel to mop up sweat and tight-fitting bike shorts or pants, preferably ones that are padded, to minimize discomfort.